About This Photo: While serving in the US Navy as a musician, I was fortunate to spend a lot of time in Naples, Italy, first arriving in January of 1982. I had the good fortune of living about 15 miles from the crater of Mount Vesuvius at Capodichino. Yes, this was the same Vesuvius that erupted and buried Pompeii in 79AD. Pompeii is about 15 miles from the crater in the opposite direction of where I was now living… In the 79AD eruption, Vesuvius shot one and a half million tons of rock per second up 21 miles in the sky at 100,000 times the force of both atomic bombs dropped at Hiroshima and Nagasaki combined. Wow, that was kind of dark, but you get the point, this mountain will erupt again and it ain’t gonna be pretty. People back in 1982 were saying, “it’s overdue, it’s going to blow again soon.” At that time, Vesuvius had lights going up the eastern side from a chair lift that had been installed sometime in the early 1950’s allowing you to see the silhouette of the mountain at night. I left Naples after almost three years in December of 1984, sadly thinking I’d never come back and not knowing that the chair lift also closed. I did come back, a lot, in 1986, 1988, 1996, and 2005, and even after retiring in 2011. Frankly, returning to Naples became more of a hobby than a military reassignment, somebody thought it would be fun to keep sending me back, and I loved just about every minute it. I came to figure that if I actually asked for it, they wouldn’t send me. 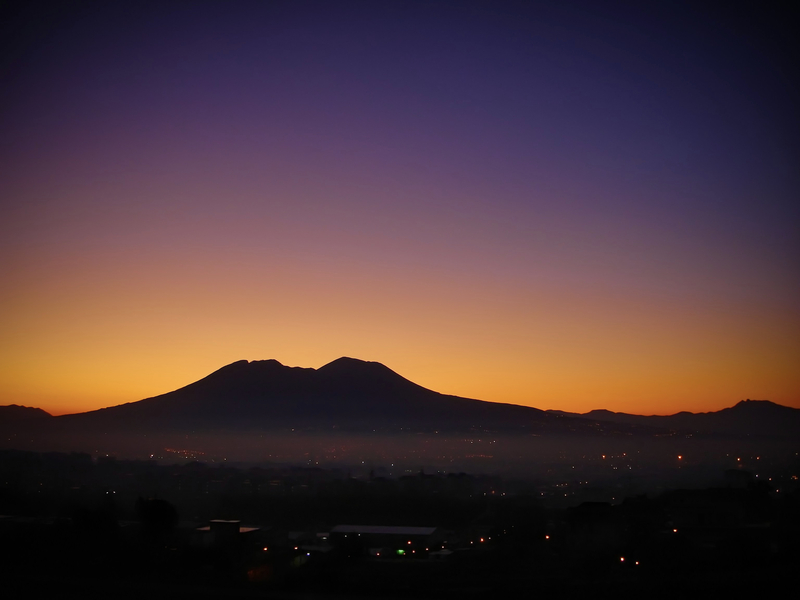 The chair lift lights were gone at night and the base had changed dramatically from a couple of softball fields, two airplane hangers, and a pool that didn’t hold water, to a modern military facility; but that silhouette of Vesuvius was still amazing, especially in the mornings. My final tour on active duty began in 2005, it was also about this time I again became interested in photography. For 20+ years, like a moron, I traveled all over Europe and Asia on the Navy’s dime but didn’t have a camera. Why? Mostly because I was younger and much smarter than I am today, apparently knowing it was much better to blow one’s money on beer rather than some trivial photography hobby. That’s basically sums it up, it’s also a major regret today and up there with not paying attention, ever, during high school… A SQUIRREL!!! Stay with me, in 2005, I bought a Sony Cyber Shot (DSC-W7) not knowing if photography was something I’d continue. This digital photography thing kind was kind of scary. I had been used to mailing in rolls of film to get developed and waiting weeks to see how my skills did, or didn’t, improve. Taking pictures had changed and instead of paying a lot of money for multiple blurry shots of one subject, at multiple f stops and shutter speeds, there was now a touch screen where the undesirables could be deleted forever – and free of charge! How cool was that? We take things a little for granted these days, my kids find it unbelievable that there was a time without cell phones and Google. During those last years of active duty in Naples, I’d get in to work early and go to the top of the parking garage and get some shots with a little tripod. It was almost always incredible and in the years to come this was my spot for morning shots. I did this mostly out of not wanting to forget the huge part of my life that Naples had become. Even though the above photo was taken with a little pocket camera, it’s still an important memory for me because it’s the first photo I took that kind of wow’d me. Below are a few other photos taken from the same basic location where blue, orange, and purple skies can be found if you get there early. I’m not one for photography without clouds, but the above photo, Morning Blues, works perfectly for me with a clear sky. Every time I went to Naples from 1982 to 2011, people still said, “it’s overdue, it’s going to blow again soon” but fortunately it hasn’t…. yet.